Calling all Watercolor and water-media artists! 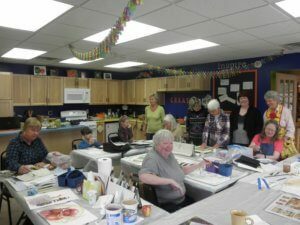 Join lola for Watercolor Wednesdays SEPTEMBER through MARCH. Every Wednesday, Sept. 2018 – March 2019 10:00 – 4:00 p.m. FREE. The art room is yours for the day. Bring your works in progress, start something new, or get help with something old. Meet other watercolor friends, share and create together. This is a time for you to get inspired and get some work done. An artist will be on hand to facilitate and help with questions or any other sticky or tricky bits. This is a safe and encouraging environment to share your work and learn from each other. Come paint and create! Drop in for an hour or two or stay all day! Bring a bag lunch or visit a local restaurant. Arches 140lb. Cold Press Watercolor Paper in 22 x 30 Sheet for only $6.00 a sheet!